TGIF - Helping Mommy Around the Office! The weekends is almost here - A-G-A-I-N!! We are loving this Holiday Season! We decided to help mommy today so she finishes her work as quickly as possible to go to the backyard with us - As you can see, I am ready to go! Mac is working hard keeping her seat warm for her - he is very good at it! Lucky is working on the shipping depawtament - she is having a little trouble as you can see, given her lack of opposable thumbs, but we have faith in her - she will get it done. We will be extra careful to not ship her with the package! Hope is helping too - she is watching for the Big Brown truck, and keeping Lucky on time! Bruce is doing his part too! He is keeping it guard and making sure everyone is on track, on schedule, and no one lives the room until the work is done! We are a great team, and can't wait to have loads of fun this weekend! I don't know about you kitties, but I just LOVE a good box! Actually, I love any box... Big, small, new, old... They are my favorite thing, and the best place to hang out! This one below is my favorite! Meowmy put it right next to her computer, so get to spend a lot of time together! It is big, and to make it extra special she put a bunch of tissue paper on the bottom... so cozy! LOVE IT! 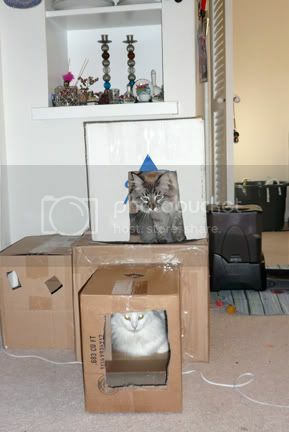 We like boxes so much, meowmy even built a fort for us! We have been using it for months and months, and it still stands strong! So much fun to play hide and seek, jump on it, or just chill on it! What about you, do you like boxes too? Do you have a box fort? Pee ess: Hope Update: She is doing much much better, eating playing, and getting to be her happy little trouble maker she used to be! She did have a loose stool yesterday (yucky, sorry folks), so she is not all better yet, but meowmy is diligently working on rebuilding her intestinal flora with Bene-Bac. She still has to sprinkle a little dust of Fortiflora over the food just for flavor, but not much... Meowmy doesn't like it - she says it has yucky stuff in it... Anyways... At least she doesn't have the bad runs anymore (the loose stools happened only once too), and she is eating normally again! Oh, that is the part meowmy is the most relieved about! Meowmy will continue to keep her on Bene-Bac as long as needed, and she will be visiting the vet soon, as she needs to take her shots before the 24th.